A man walks by a painting on a wall of Venezuelan President Hugo Chavez in Caracas on January 9, 2013. Venezuelan President Hugo Chavez is supposed to be inaugurated tomorrow kicking off his 14th year as the country's leader. But he won't be there. Chavez is in Cuba undergoing cancer treatment. There is little information about his condition or when he may return. Opposition leaders are demanding new elections if Chavez cannot be officially sworn in, but Venezuela’s Supreme Court today said he could be sworn in later. 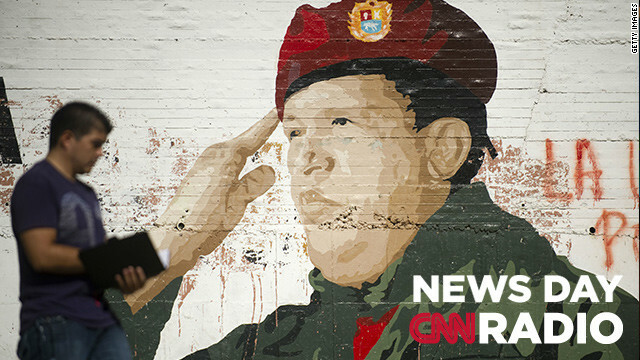 We spoke to CNN's Paula Newton in Caracas. "The people are very uncertain about what's going to happen. This is not a good sign for investors and the economy here is really limping along and there is no indication that this government Chavez put in place really has any ideas on how to improve it." Despite reports of bombing and deaths in Damascus – there was a positive development in the Syrian conflict.The Assad regime struck a deal with the opposition to release 2,130 Syrian prisoners in exchange for 48 Iranians. CNN's Jonathan Binder reports on the exchange and why Iranians were part of the deal. "The surprise was Bashar Al Assad never asked about releasing any of the regime forces," says Louay Al Mokdad, a spokesman for the Free Syrian Army. "I started to think, what would happen when I’m out of the Marine Corps? With having PTSD, the first thing that popped into my mind was, not to be funny, but one of the Vietnam vets who’s lost his marbles, and is on the side of the road with that sign. I was crying on the phone, telling my Dad that I was sorry for everything that was about to happen."